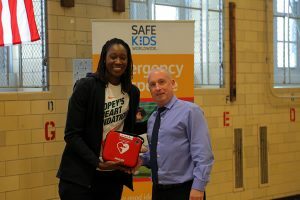 NEW YORK, NY – APRIL 21, 2017 – WNBA All-Star and center for the New York Liberty, Tina Charles, in conjunction with her Hopey’s Heart Foundation successfully launched her 1st-ever Hopey’s Week initiative on Wednesday-Thursday, April 19-20, hosting four different sports safety clinics over the two-day period, each one in a different New York City borough. 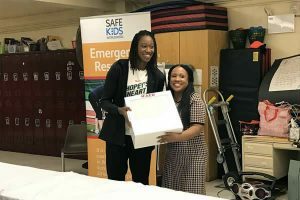 Working with her partner Safe Kids Worldwide, Charles visited Thurgood Marshall Lower School (Manhattan), Kings College School PS 94 (Bronx), Mary White Ovington School PS/IS30 (Brooklyn), and Robert Van Wyck JHS 217 (Queens). 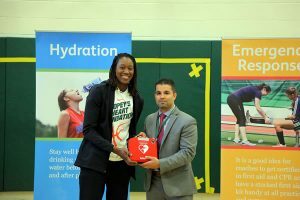 Students who participated in the clinics learned about the importance of being prepared with CPR and AEDs (Automated External Defibrillators), concussions from specialists from NYU Langone Medical Center’s Concussion Center, the keys to proper hydration, and medication safety. Hopey’s Heart Foundation, which Charles founded in 2013, naming after her late-aunt Maureen “Hopey” Vaz, who passed away from multiple organ failure, serves as an AED grant program, focused on preventing sudden cardiac arrest deaths across the nation and the globe. 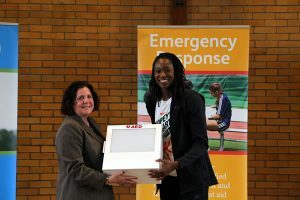 Charles donated an AED to each of the schools she visited during Hopey’s Week to ensure that their students and community would be heart safe. Since 2013, Charles has donated 262 AED’s across the globe. The Hopey’s Heart Foundation was formed in memory of founder Tina Charles’ late aunt Maureen “Hopey” Vaz, who died of multiple organ failure on March 9, 2013. Founded in April 2013, Hopey’s Heart Foundation (“HHF”) is dedicated to raising awareness to Sudden Cardiac Arrest from claiming the lives of promising student athletes around the world. It is committed to placement of automated external defibrillators both nationally and internationally with its Automated External Defibrillators (“AED”) Grant Program. The AED Grant program welcomes all non-profit organizations, including schools, parks & recreations and emergency response departments.